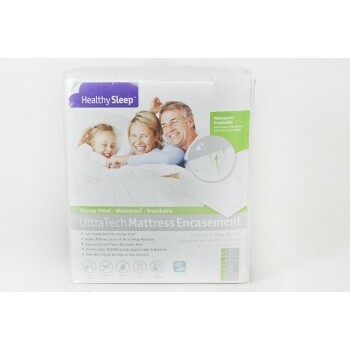 Healthy Sleep Ultra Tech Mattress Encasement is specially designed with functionality and personality in mind, setting it apart from your ordinary encasement. It is made from 100% polyester and breathable polyurethane which is silky smooth and soft to touch and the laminated material is 99% Dust Mite free. It is waterproof on all 6 sides of the encasement which is great for double-sided mattresses. The Ultra Tech is designed with a sport type fabric that wicks away moisture (we perspire when we sleep – up to a liter a night), which allows body heat to pass through and provides a comfortable and cool sleep environment. It also features Silpure, an antimicrobial enhanced fabric treatment, which guard against odor and bacteria. 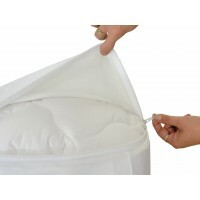 It is guaranteed allergen-proof and water-proof and will create a barrier against bed bugs and dust mites. The patented design ensures you have a clean and healthy bed for a more luxurious and comfortable sleep. The 12+ signifies the ability of the encasements to fit mattress depths greater than 12 inches. The Healthy Sleep Premium, Premium Plus and the Ultra Tech will all accommodate mattresses 9 – 16 inch depths. This is an easy way to put on the mattress encasement. Turn the mattress across the mattress foundation so it is sideways and place the mattress encasement with the topside up (see the arrow indication at the patented bug guard zipper closure system). Then slip the mattress encasement on over the bottom of the mattress and then uniformly slip it down so each side moves down the mattress until it covers the entire mattress. Pull the top and bottom of the encasement so they meet. 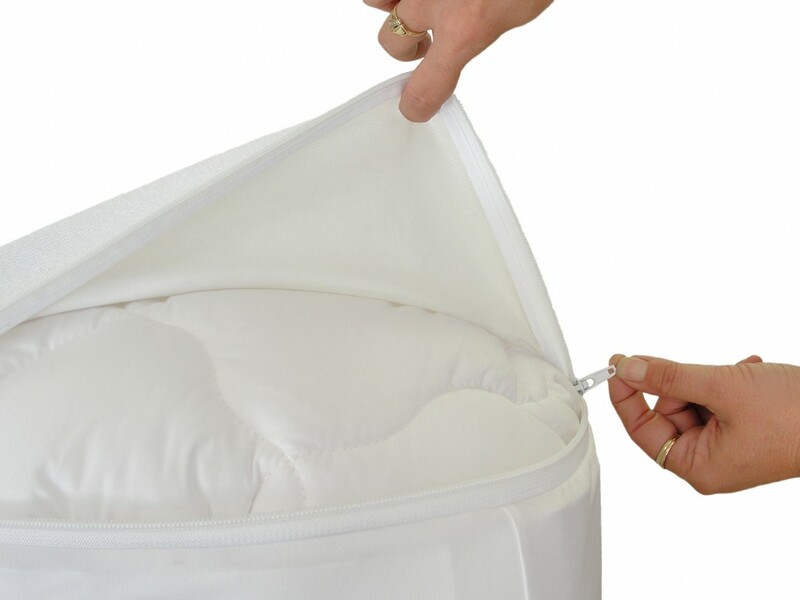 Carefully zip closed the mattress encasement until it is fully zipped on the patented Velcro Enclosure System. Secure the provided zip tie through the zipper pull and loop on the encasement. While it is easier with 2 people, 1 person can easily accomplish this. Bug Guard enclosure system stops bed bugs and dust mites in their tracks. It’s the only encasement you’ll ever need! 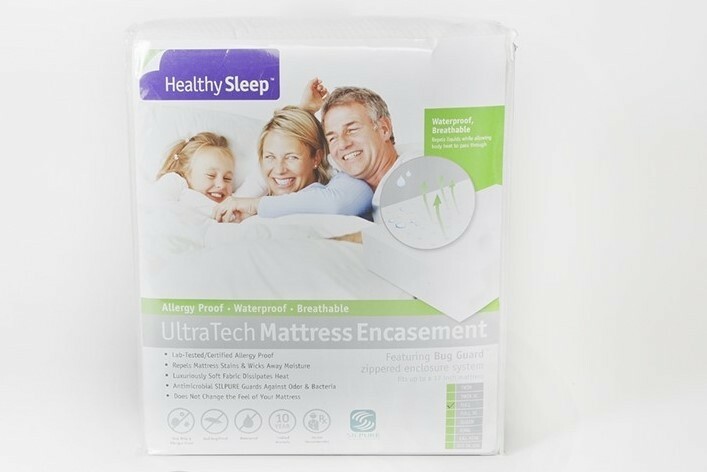 Protecting a brand new mattress with our Mattress encasement will create a barrier to resist dust mites and allergens from taking up residence in the mattress. Our zippered enclosure system stops both the entry and exit of bed bugs and dust mites with a combination of its micro-zipper teeth; Velcro seal back wall and inner wall construction, enveloped seam finishing and bed bug proof fabric. Unlike other waterproof encasements ours is breathable, allowing body heat to pass through it and provide a comfortable and cool sleep surface. The mattress encasement is durable, but thin enough that it does not change the comfort or feel of the mattress. Doctor recommended for a healthier sleep. This product will protect your mattress for years if maintained properly. Machine wash in Warm or Cold Water, Tumble Dry on Low or Medium Heat. DO NOT DRY CLEAN - No Ironing Needed. Please do not return your encasement to the place of purchase! 2. Machine wash and tumble dry the mattress encasement immediately after spillage incident, optimally while the fluid is still wet. 3. File your warranty claim within 5 days of the incident. 4. The product must be returned to GBS Enterprises for inspection and validation of the claim. 5. Retail receipt for your GBS Mattress Encasement and mattress must be provided for a validated warranty. Warranty claims are considered open for a period of 90 days from the original claim date. In the event that the consumer has not executed their required duties of the warranty process within that time frame, GBS Enterprises will consider the claim closed and the warranty shall end.